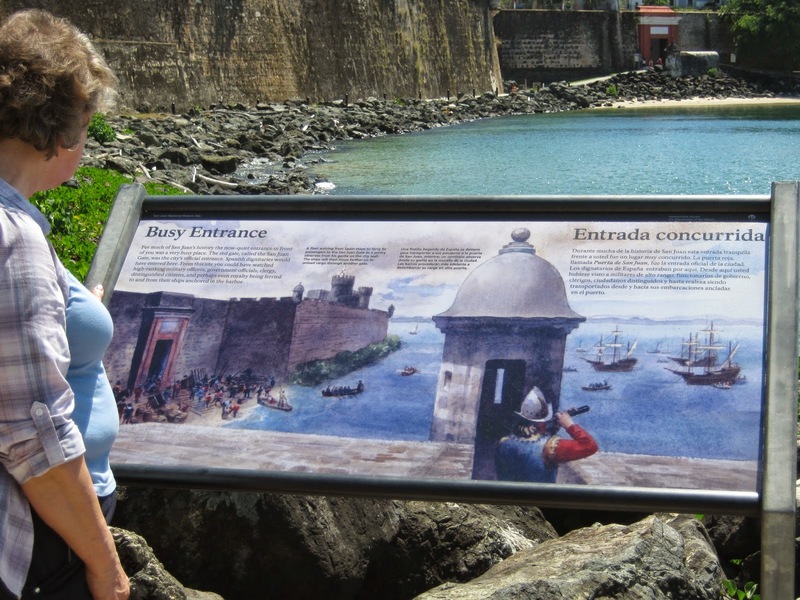 Dorothy and I were in the Caribbean in March 2014. 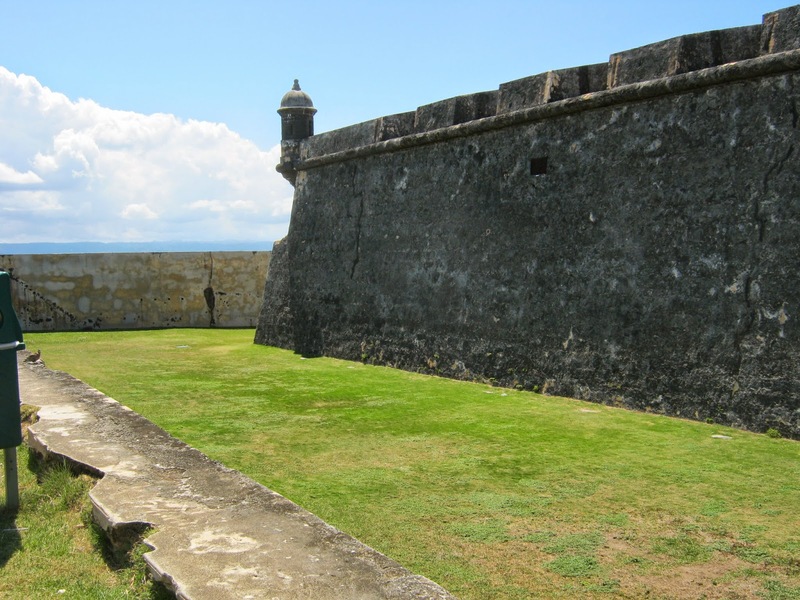 You might enjoy photos of 18th Century-ish Spanish and English fortifications we toured. 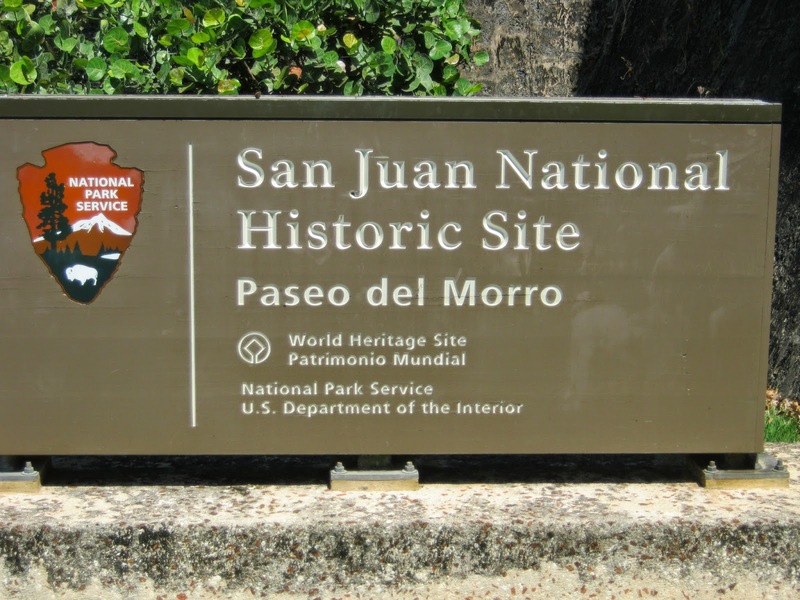 Castillo del Morro, San Juan, Puerto Rico. 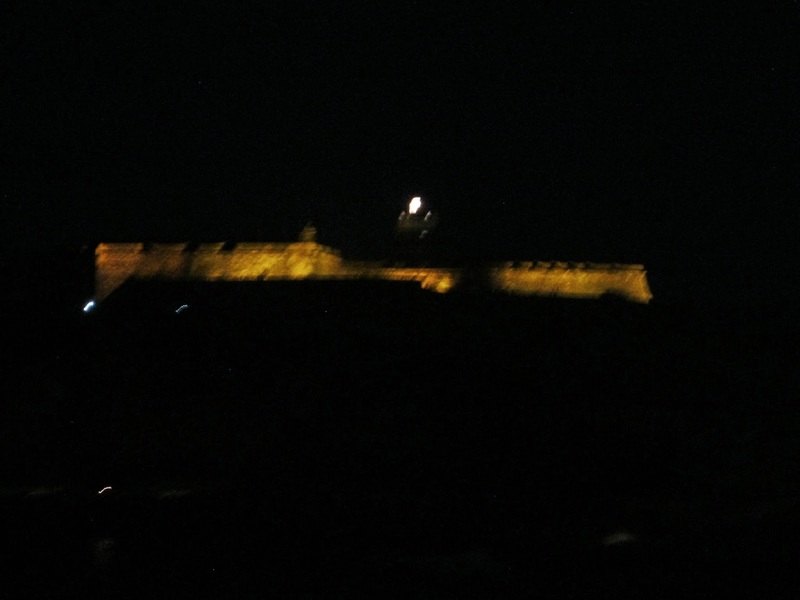 Sometimes in Spanish it is called El Morro. This is the landward approach with a superior field of fire (glacis) versus attackers. 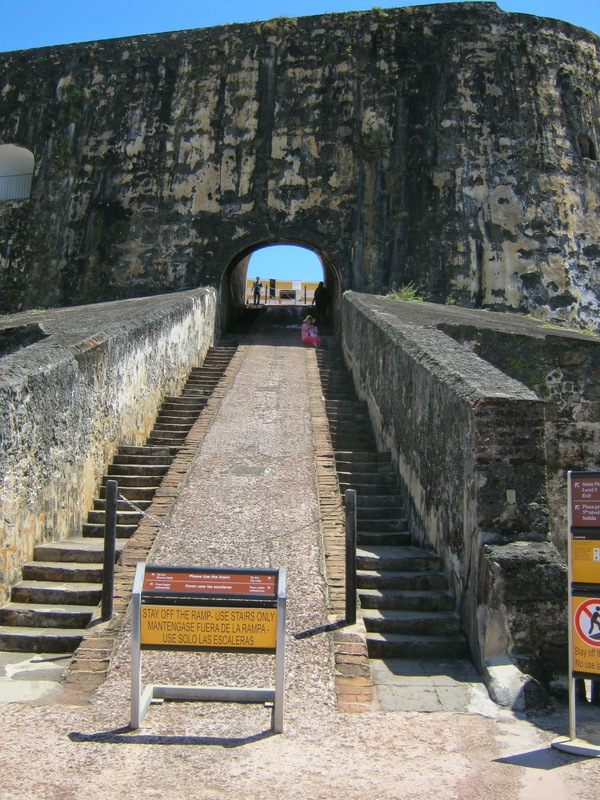 The water gate in red was for dignitaries and lots of other things to enter directly from ships. This explains the seaward water gate best. Click to enlarge and read. The seaward wall looks impossible to climb unless you are a WWII US Ranger trained to ascend Point du Hoc on D-Day. Back to the landward entrance. A bridge piece near the main (only?) 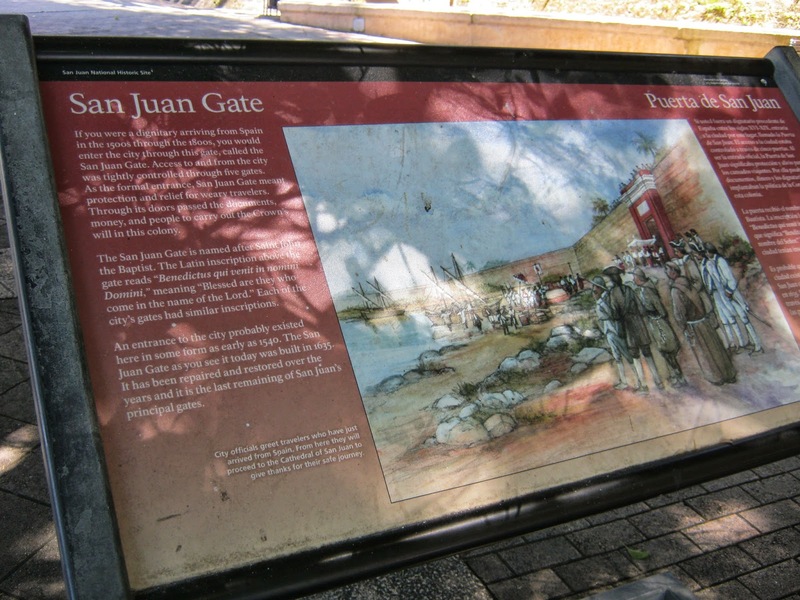 gate would be removed so attackers could not use the bridge to get to the gate itself. Ditch to the left of the bridge. This little fellow is interesting because of rope attached to the wheels. Why? To reduce chances for the metal wheel rims to cause a spark and an explosion. 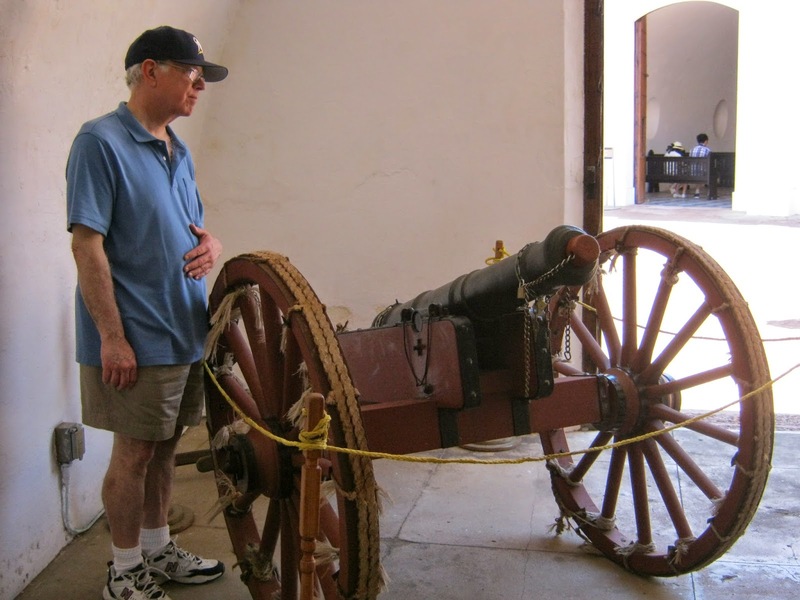 Gun powder was loaded with scoops from barrels. Implements were made of wood and IIRC copper or bronze because these can't cause sparks either. Main guns like these were pointed seaward. Mighty big. Here's the idea. The ship coming into the harbor must be Spanish or friendly. 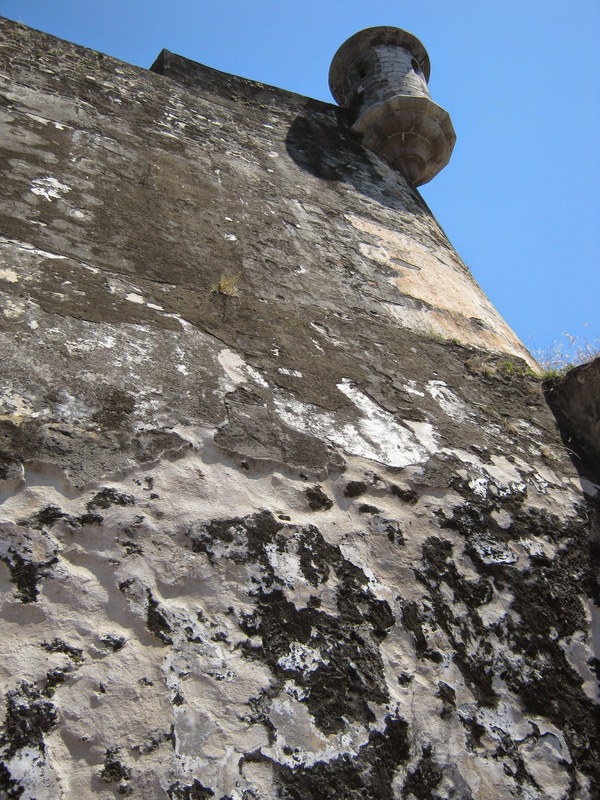 Cannons were moved to many locations inside the fort depending on need. This ramp does not look formidable. I assure you it is. People had to stop part way up to catch their breath and let their heart rate drop. Unseen are positions for soldiers to stop and rest off to the sides. It is a looooonnnnng way up and steep! 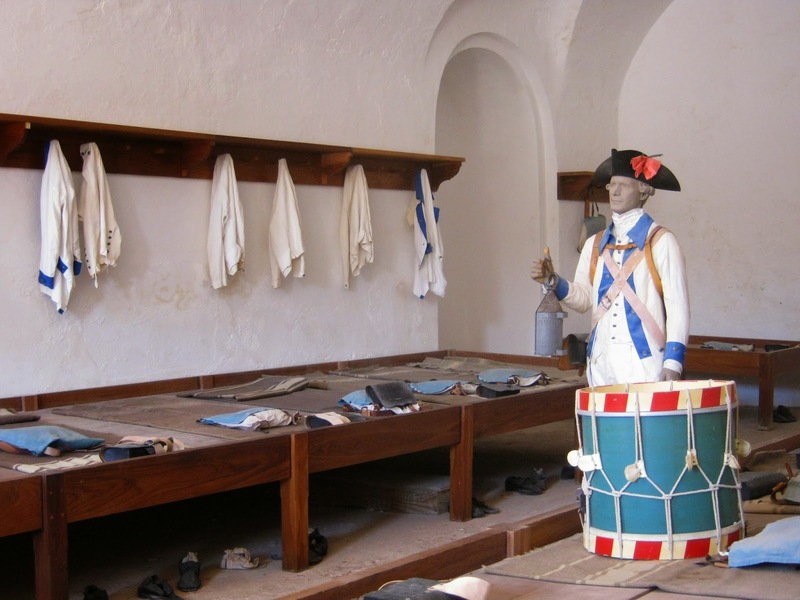 Barracks room. 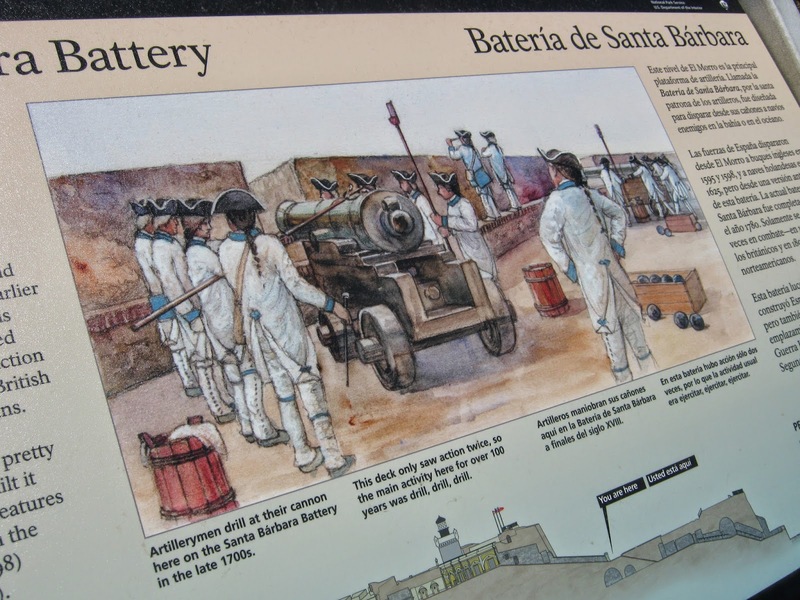 This is the identical format I've seen at Fort Niagara in northwest New York, USA. 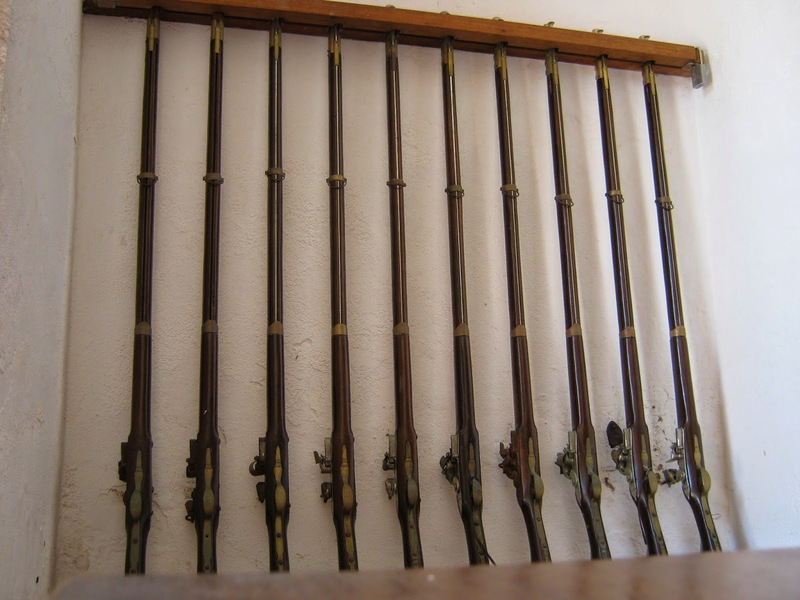 Replica 18th Century muskets. They might have been Charlevilles since these have been readily available since the USA's Bi-Centennial for museums and reenactors. 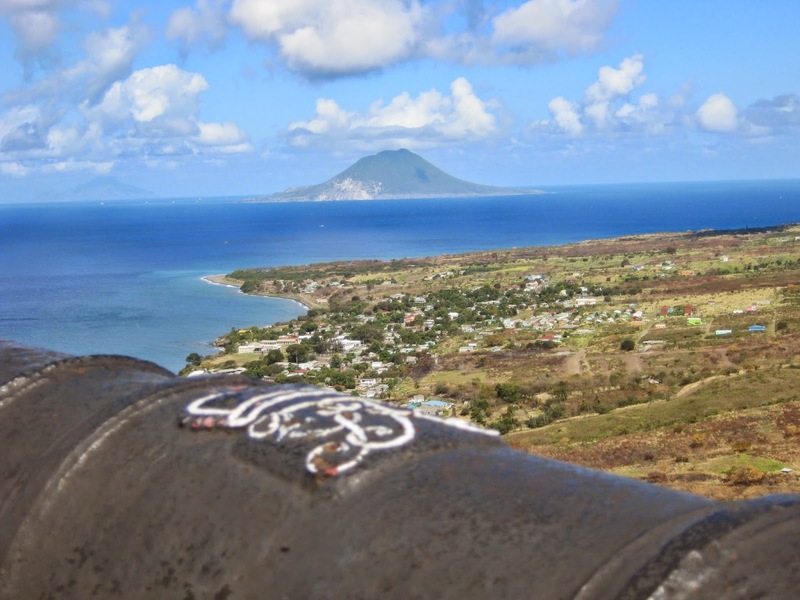 Remember that cannon pointing seaward at the ship entering the harbor? 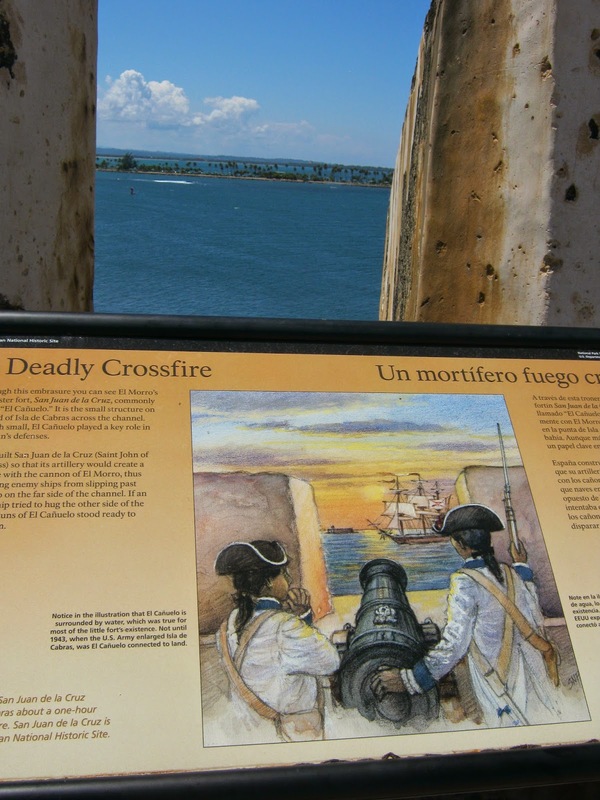 Now you are aboard that same ship looking back at Castillo del Morro and that cannon. Whew! We've sailed deeper into the harbor and nobody fired at us. Bravo! 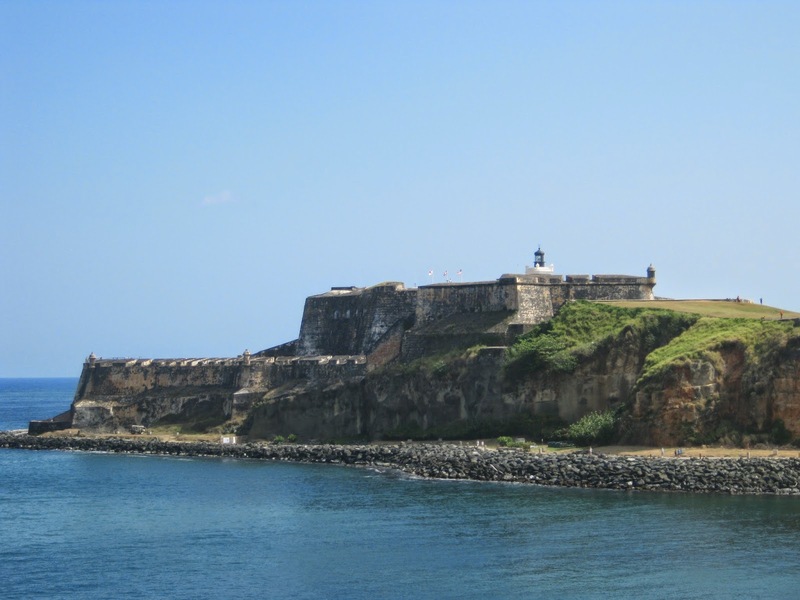 Originally the colonial city of San Juan was an island surrounded by fortress walls. Could we sail through at night? I doubt it! 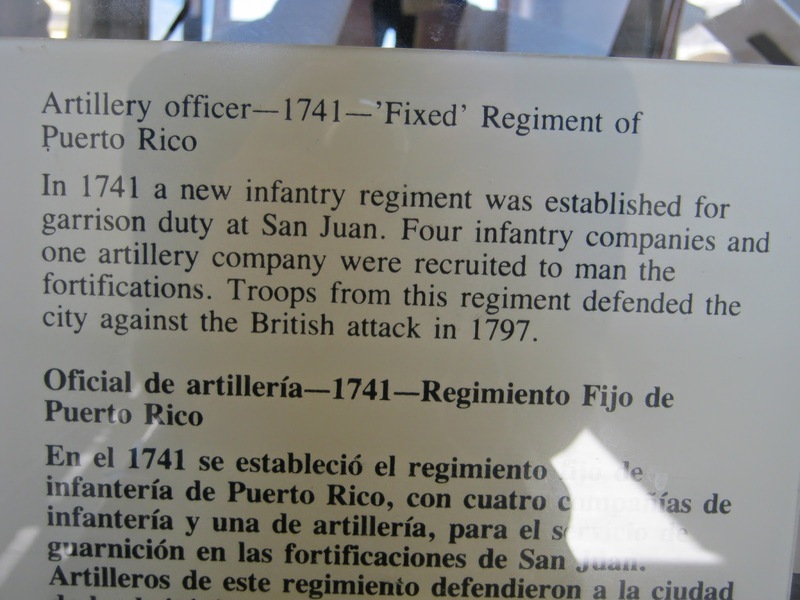 The next fort guarding San Juan is San Cristobal. 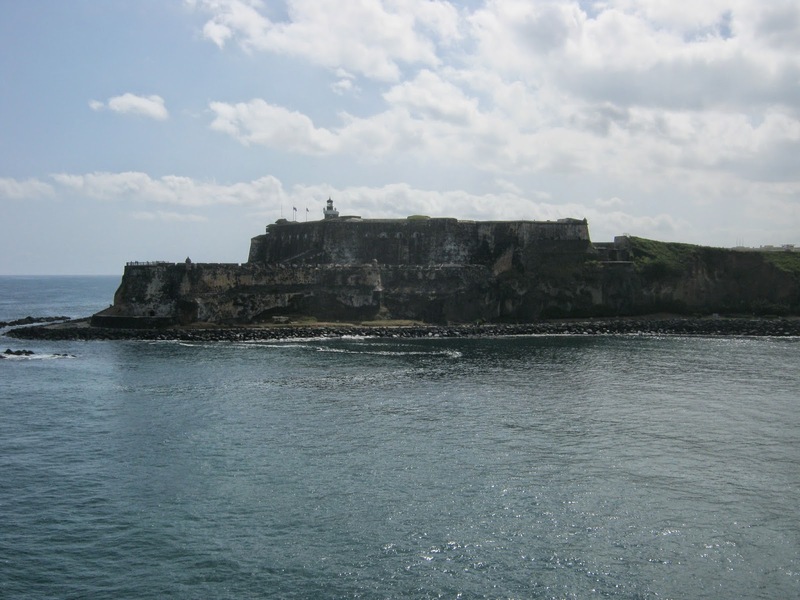 It is a mile or two east of del Morro. 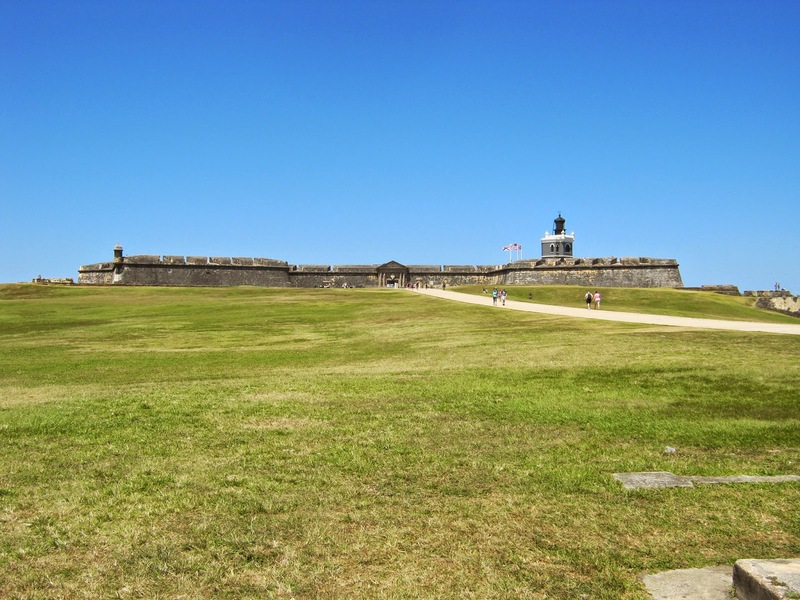 A nice walk, kite flying area and popular for picnics. 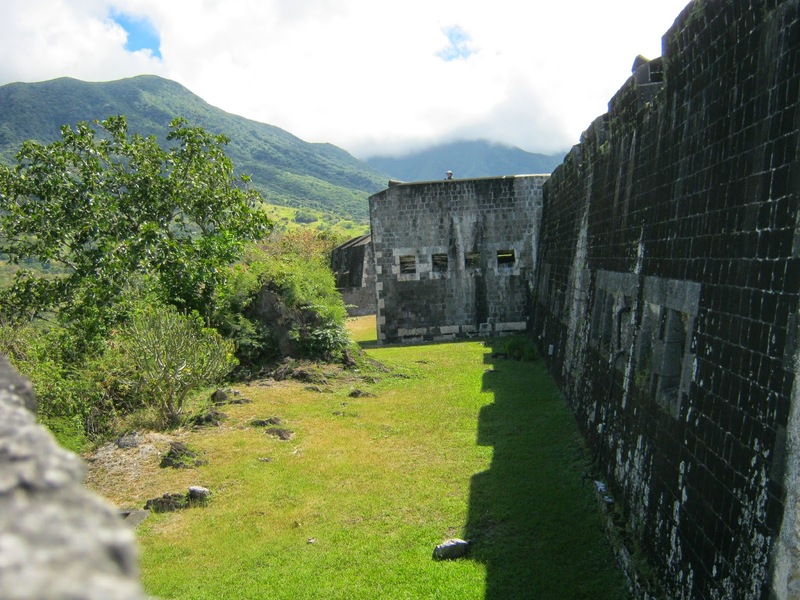 Both Vaubanesque fortresses are very complicated. Check the internet if curious. 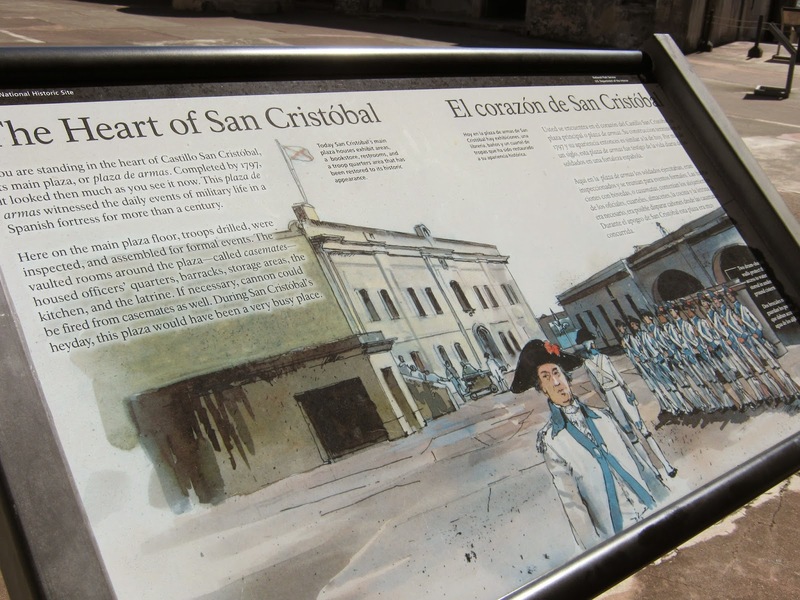 The above is San Cristobal's Parade Ground. Soldier barracks are to the left. Officers are to the right. Wide portals into officer quarters enhanced cross drafts to keep officers a bit cooler in this hot climate. Parade Ground stone slabs are sloped downward to the center for rainwater to flow through drains down to cisterns and a huge room full of water. Nice cotton uniform. See caption next and the back of the uniform for information. Back of the same uniform. 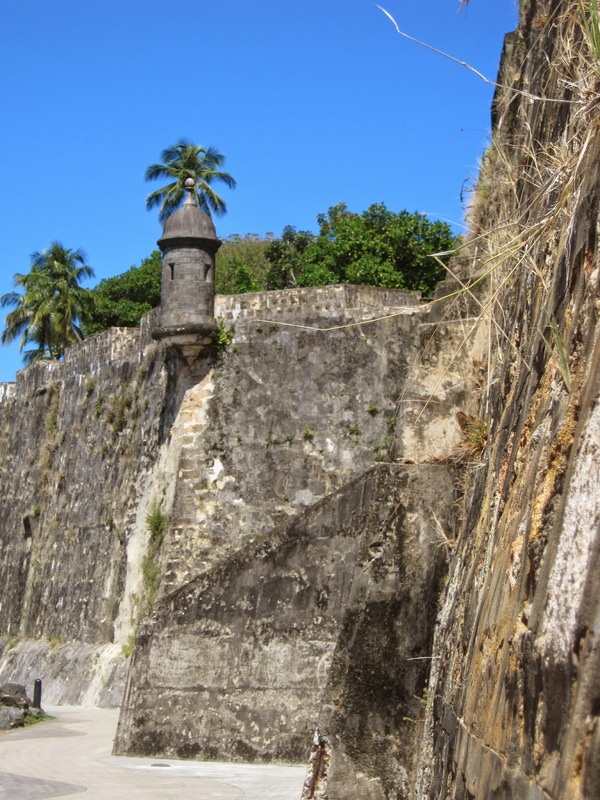 Prince of Wales Bastion. 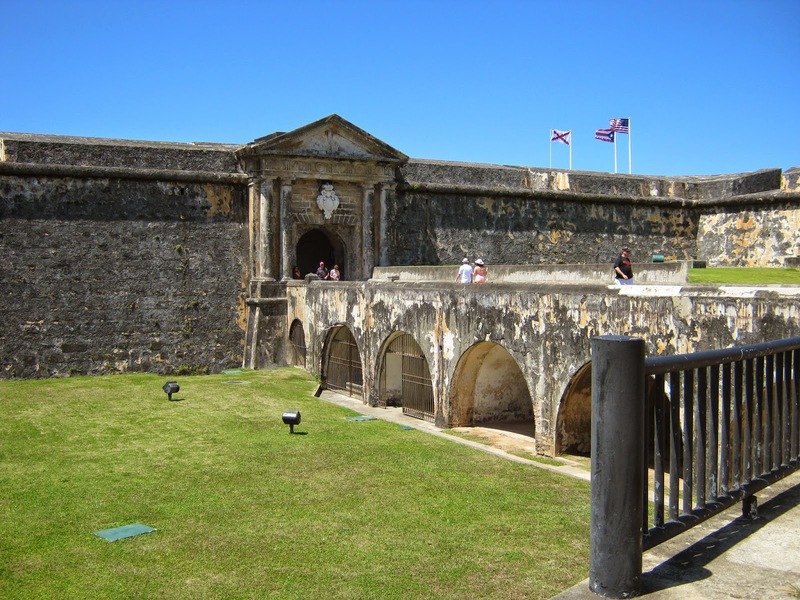 The current Prince of Wales visited this fort in the past. 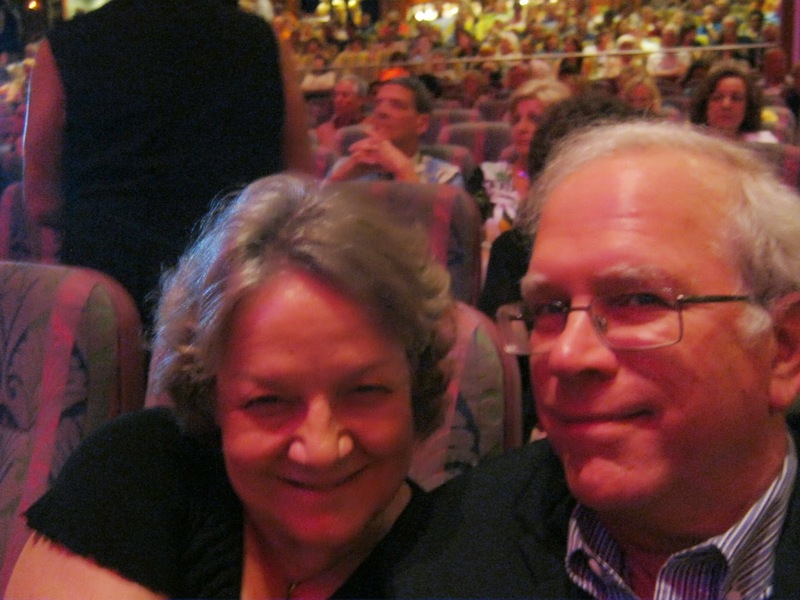 Dorothy and I were aboard Adventure of the Seas for a lovely week of cruising. I hope you enjoyed the above images and found them illuminating. 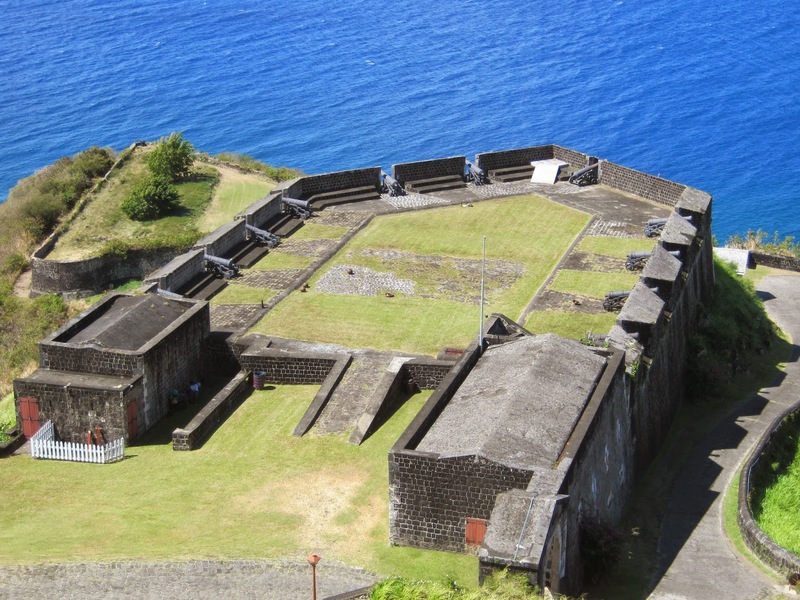 There are other forts in the Caribbean. The above offer a glimpse of two big ones and one small. Some others remain only in outline and in one case on Antigua, our brief bus tour did not take us to the mountain it was on. Next time! 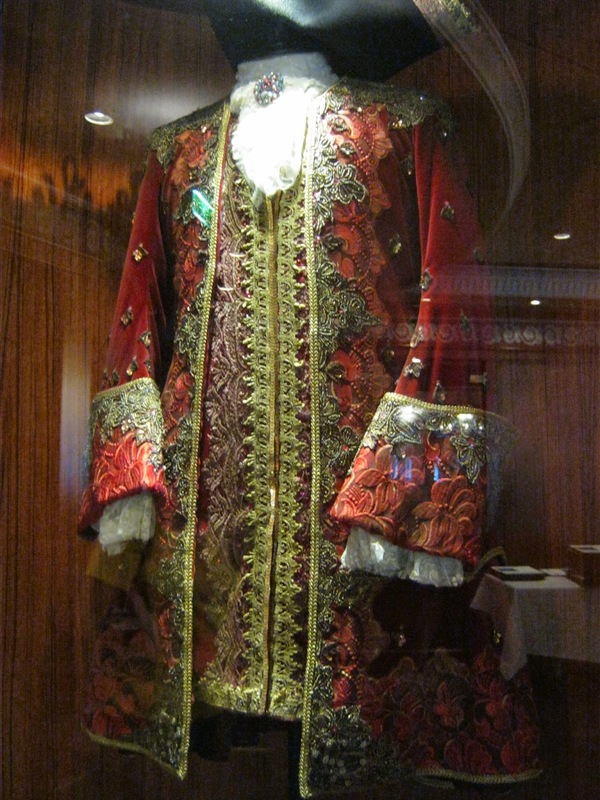 This was displayed in the Voltaire Dining Room on Adventure of the Seas. Dorothy and yours truly, Bill. Thank you for looking in. Comments are welcome from you at your pleasure. 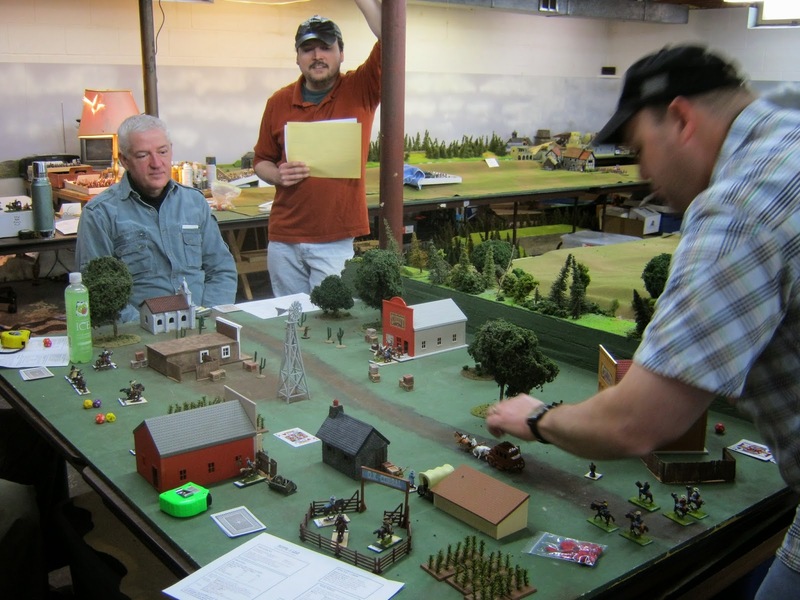 We've gathered annually for several years for a day of multiple games on the first Saturday of May on or after my birthday of the first of the month. 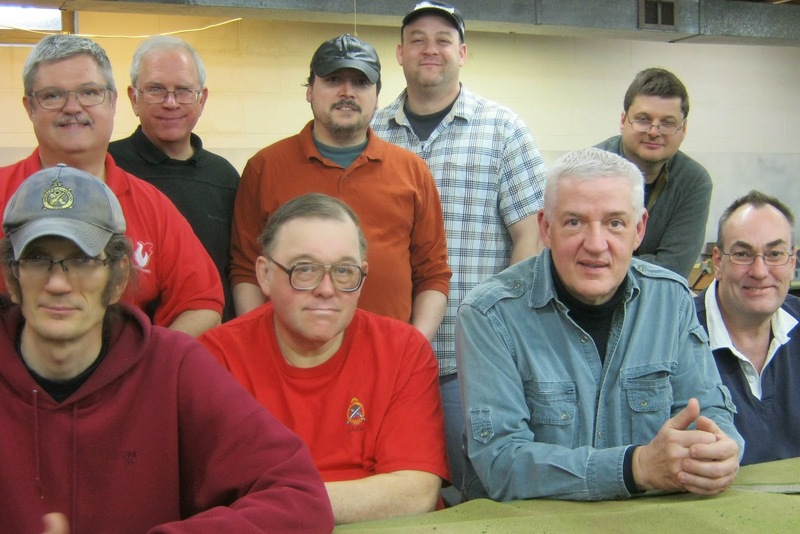 Ten of us celebrated companionably: Seated left to right are Jim H., George R., Keith L. and Randy F. Standing left to right were Michael M., yours truly Bill P., Chuck L., John B. and Curt B. John M. could not stay for the photo. 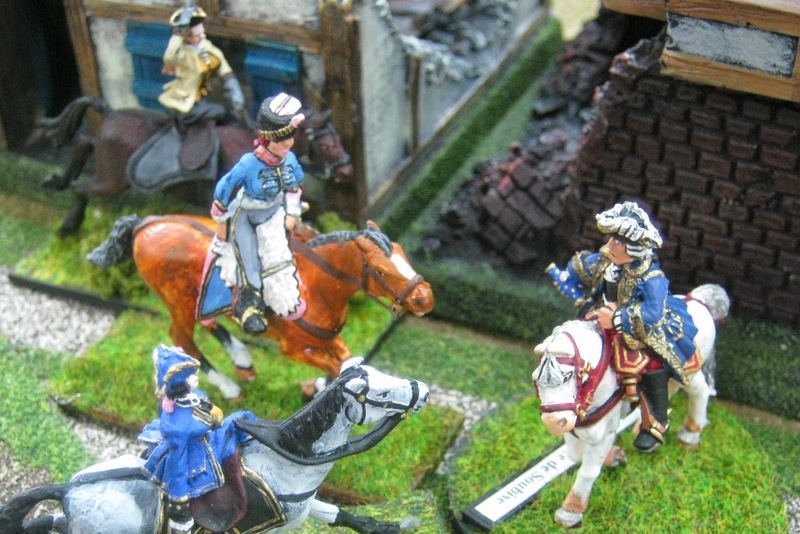 Der Alte Fritz, Jim P., who designed the scenario had to regretfully cancel a few days before game day. I sincerely appreciate all of you for celebrating with me and for all you did. Thank you very much. Chuck (center) hosted a fun warm-up game for four of us in the Wild West using Fistful of Lead rules. Keith L. (left) and John B. (right) battled in the town with Jim H. and George R. for an hour and a half. 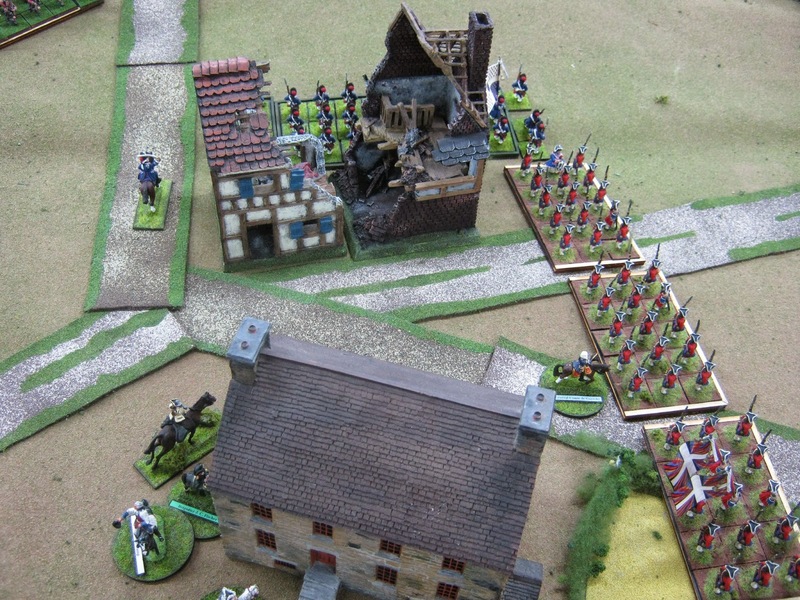 The rest of us set up and started the SYW battle of Hamelburg. Our pards always bring food to share. Here's Jim H. pausing from the western game for chow. 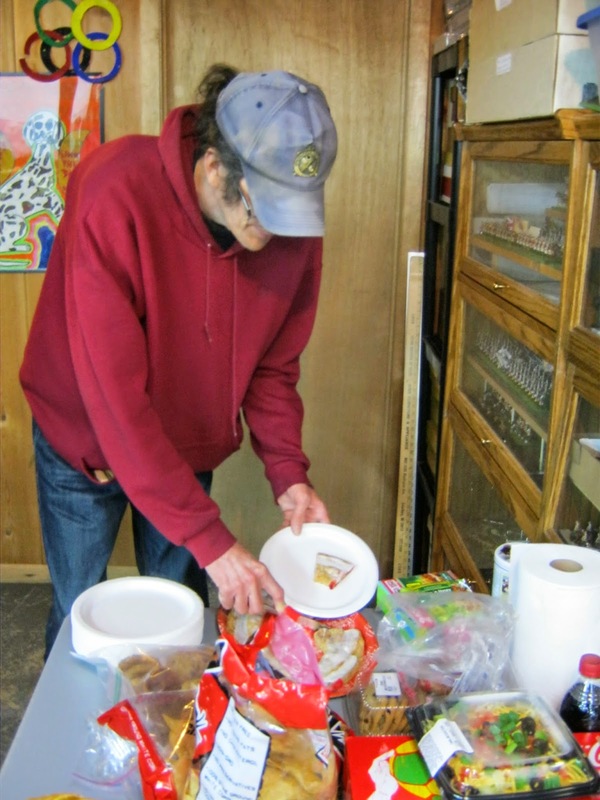 Around noon my wife Dorothy set out a scrumptious sandwich tray. Jim added a delicious spinach salad with purple tomatoes and other tasty "heirloom" vegetables. 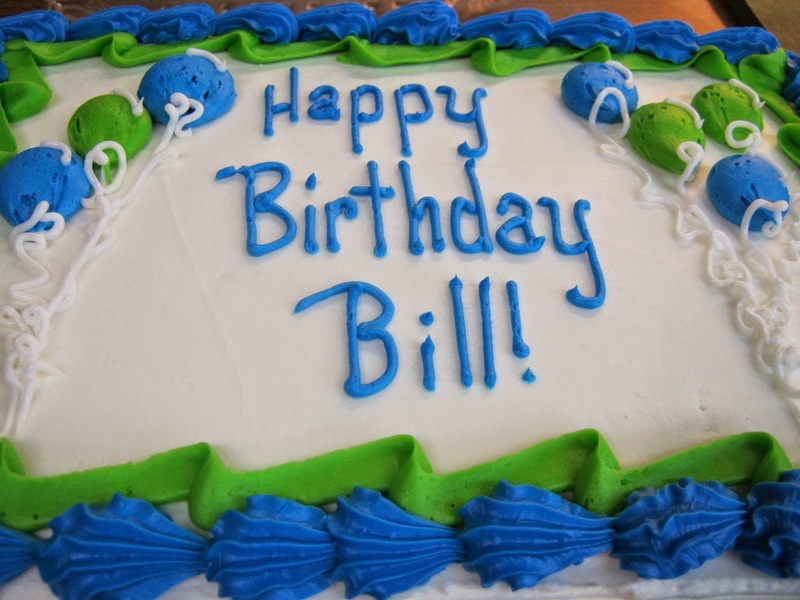 Around 3:00 p.m. my birthday cake was served. Dark chocolate cake with white butter cream icing from the unusually named by good grocery store, Piggly Wiggly. It was sooo very delicious! 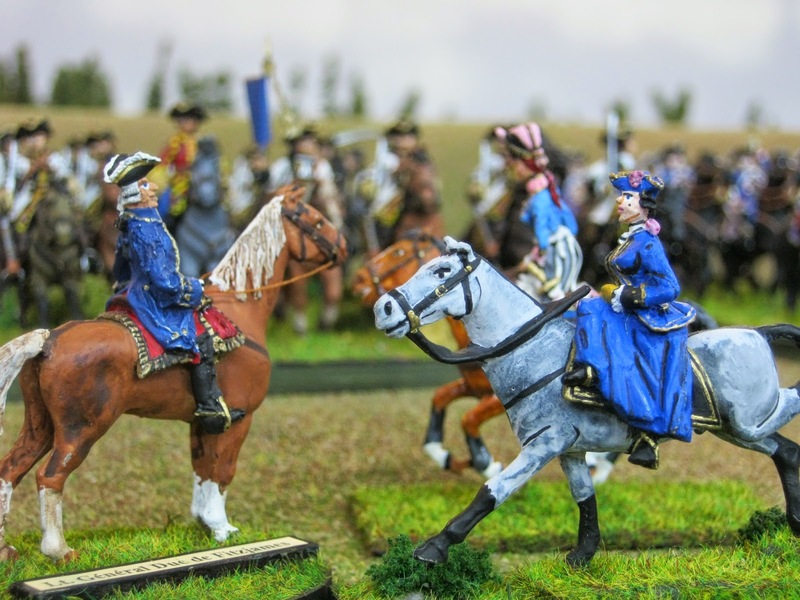 Early in the morning of May 3, 1757, three unexpected riders galloped toward a long ridge north of the Village of Hamelburg, Westphalia. The Maréchal Prince de Soubise happened to be centered atop that same height looking northwards for signs of the Allied Army as they rode near. Lady Diana Pettygree (center) was a familiar of the Prince, both having been present at Versailles social functions. 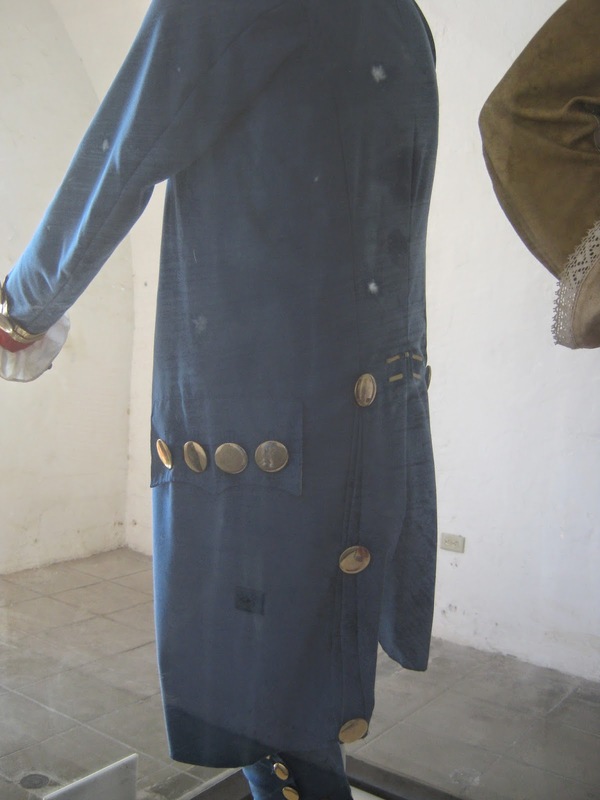 Also known to the Prince, Lady Belle Silhouette, wearing a radiant adaptation of the Bercheney Hussars was first to speak. Silhouette: "Monsieur l'Maréchal, we have information you may find extraordinary! I am breathless to reveal it." Soubise: "My eyes, ears and heart are yours my dear ladies. Hamelburg is just behind me. We'll go there to talk." 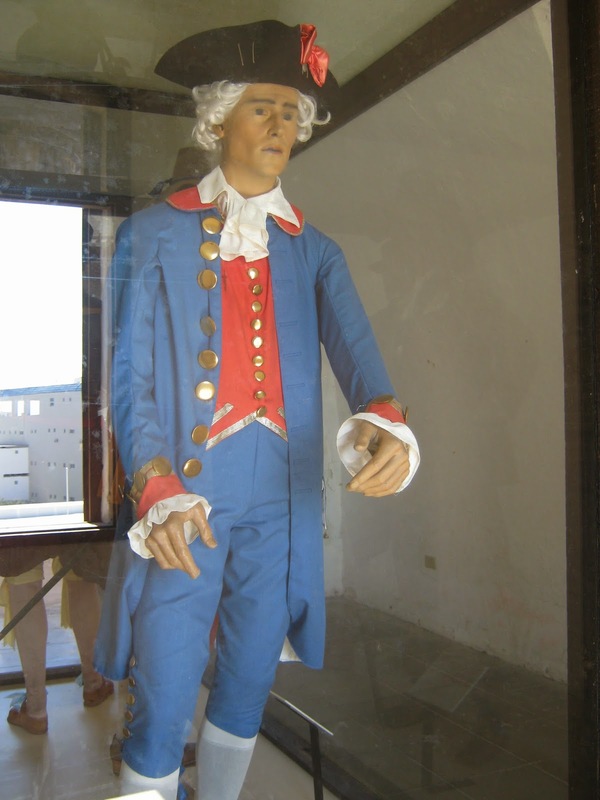 Soubise: "How may I be of service?" Silhouette: "We were in Hamburg when news arrived about your Army crossing the Rhine." Pettygree: "Oui. 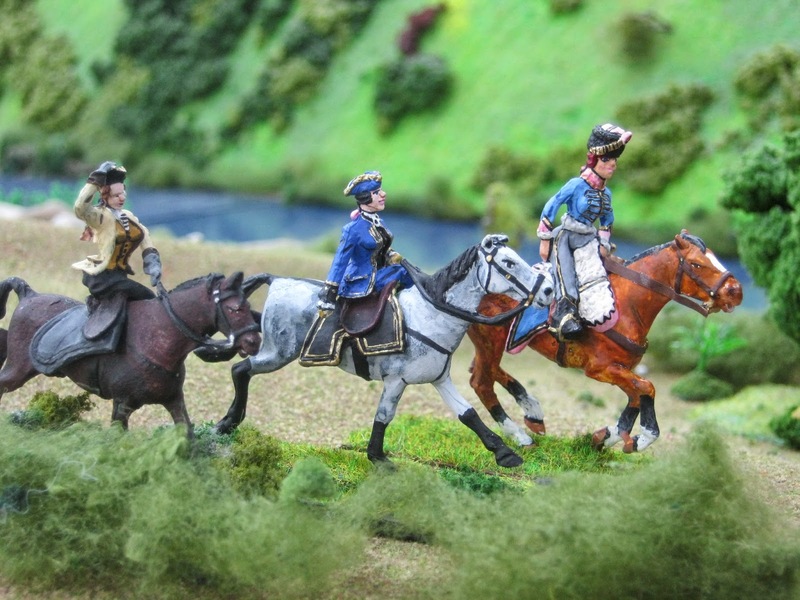 When we heard you turned north with the object of entering Hanover to discomfort George II, we thought it best to ride south to escape troubles that surely would notice two courtiers quite out of place in his domain." Soubise: "Surely he would not bother two beautiful ladies on a grand tour." Pettygree: "We thought it best to not take chances regarding the benevolence of his ministers. " Silhouette: "So we are here...."
Silhouette: "Mere hours ago, columns of force marching soldiers appeared to the east on a road converging on Hamelburg. They wore uniforms we think from Hanover, Britannia, Brunswick and others. 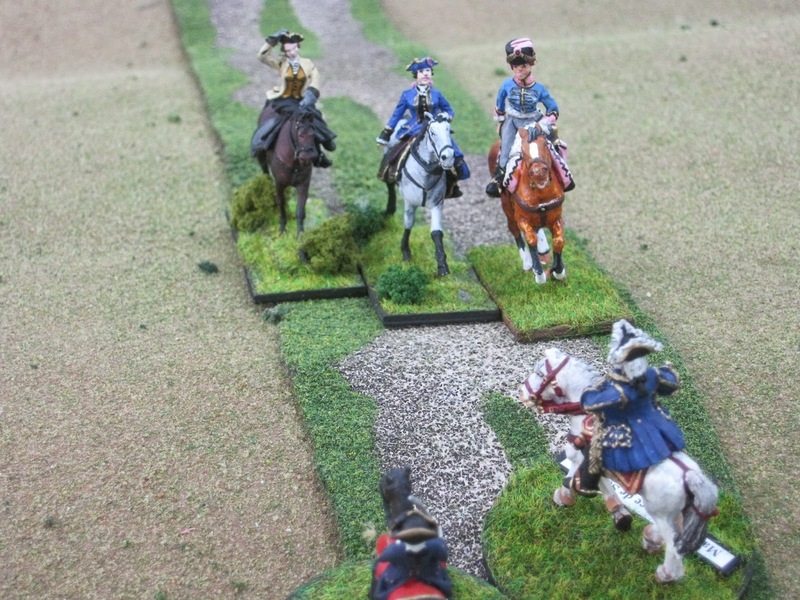 A cavalry patrol observed us and gave chase." Pettygree: "Our larger horses easily outdistanced them. 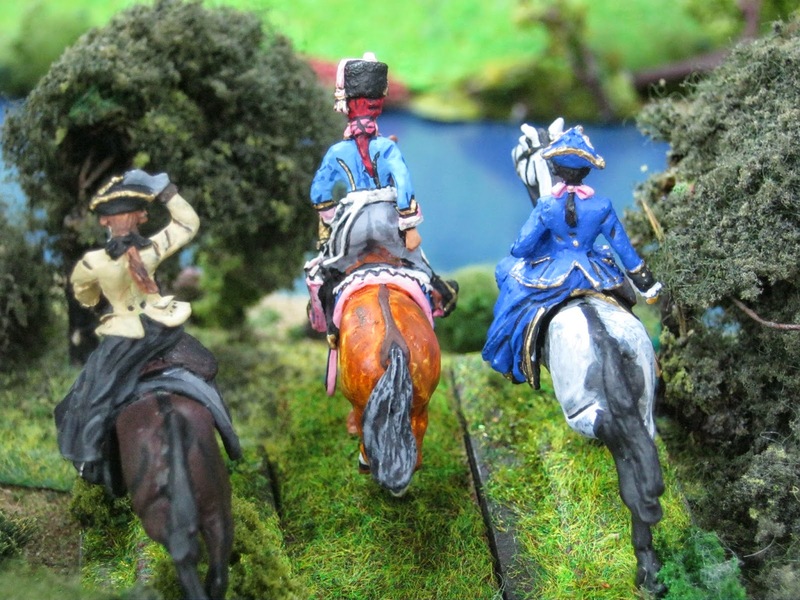 Silhouette: "They are coming here Monsieur l'Maréchal - to Hamelburg!" Pettygree: "And fast. Their Advance Guard may be here before two hours." Soubise: "You confirm what our scouts from the Legion de Fischer have told us. We will stand on this ridge. I only hope it is not too late. Now ladies continue south for greater safety. This is not a place where you should remain." Now Allied horsemen debouch on the Allied Left Flank. Advance Guard infantry in the distance prepare to advance on Hamelburg Ridge to the left. 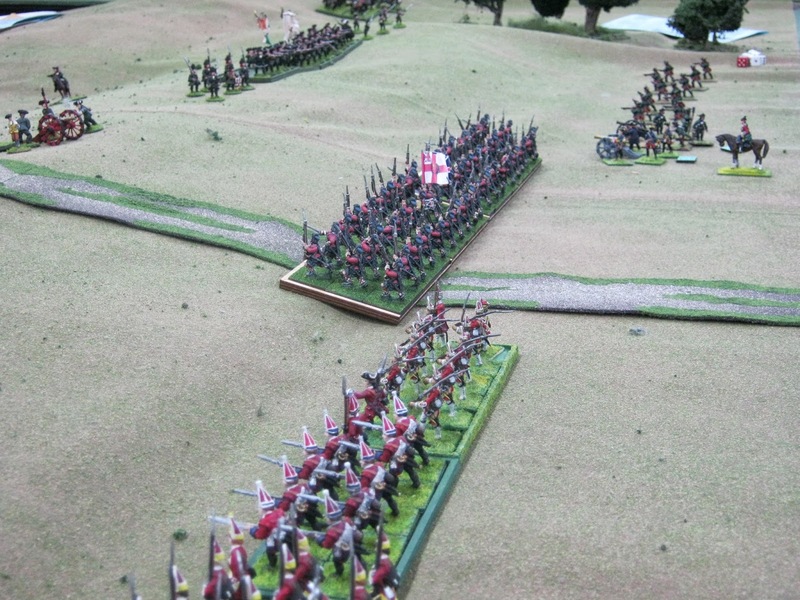 A Converged Grenadier Battalion supported on their right by the 42nd Highlanders ascend Hamelburg Ridge. Every soldier in the ranks is quiet, thinking about next moments. Officers and sergeants of both forces are heard above the drums ordering men to be steady. 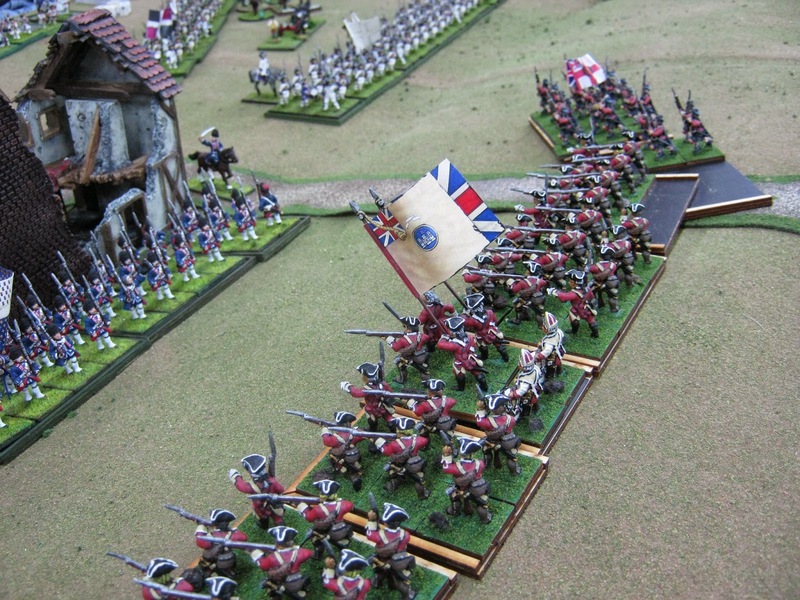 Within French ranks the men respond to "an jeu" (aim) preparatory to the order to "feu" (fire). 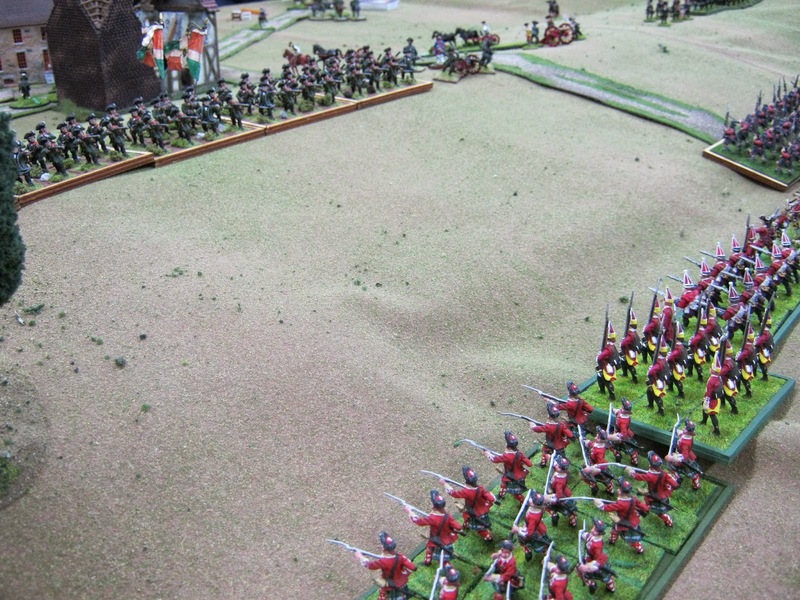 The red coats advance steadily as their distant artillery prolongs forward to give fire in support. 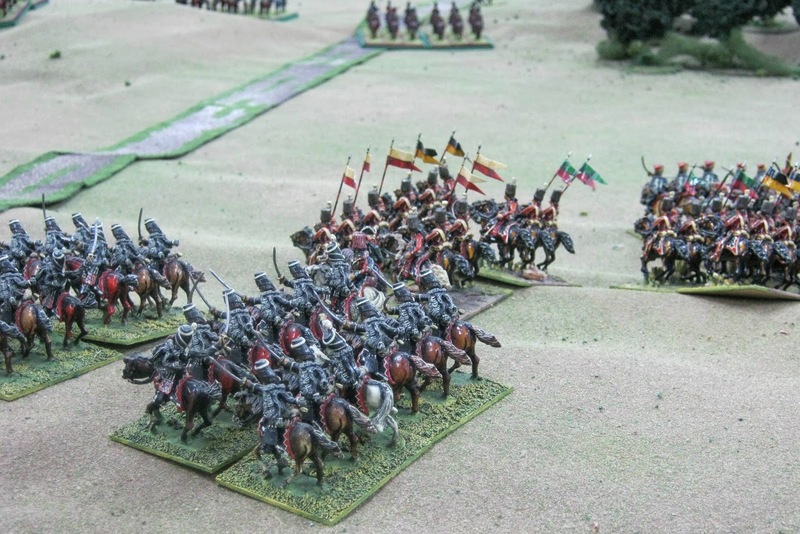 On the Allied Left Flank, Allied horsemen canter forward pushing away French light cavalry. The Allied left is secure and swings toward Hamelburg off image at the top of this photo. 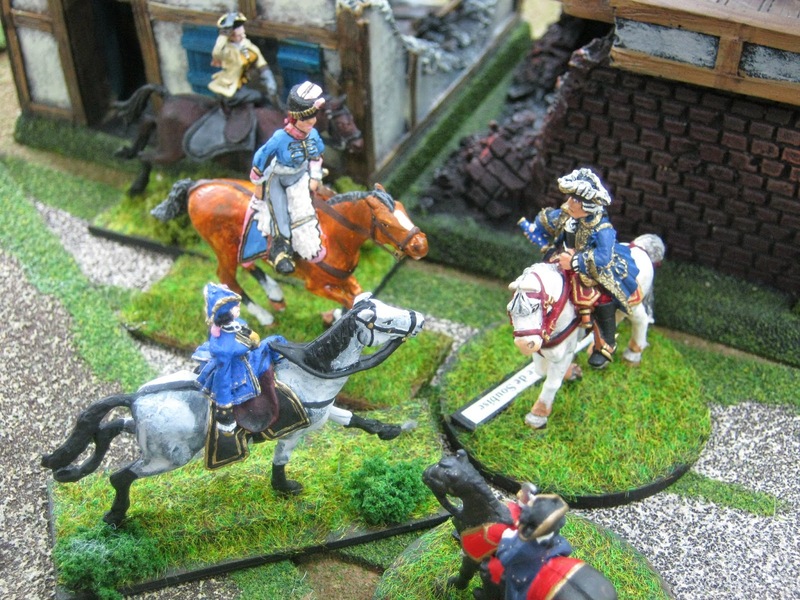 French Gardes Suisse and Grenadiers de France arrive to reinforce their friends in Hamelburg. 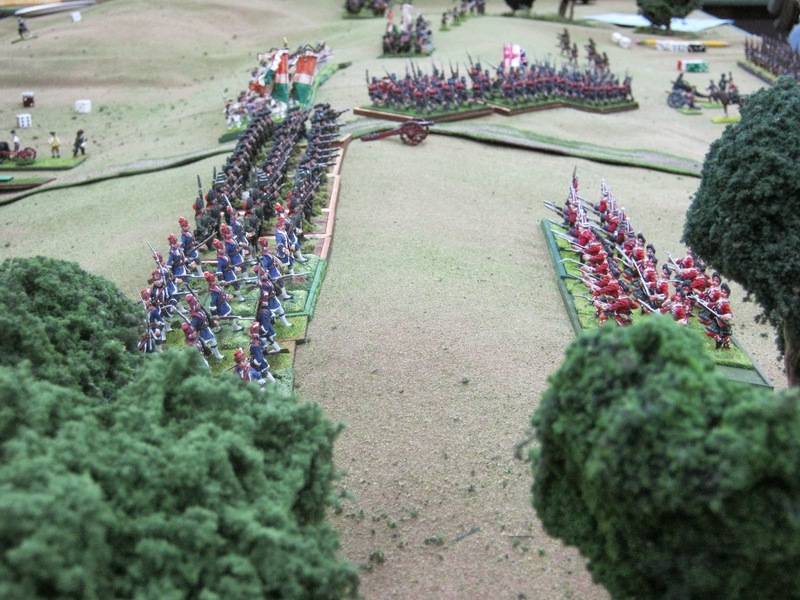 Infantry of the Legion de Fischer are seen in the upper left of this image trading volleys with the red coats. 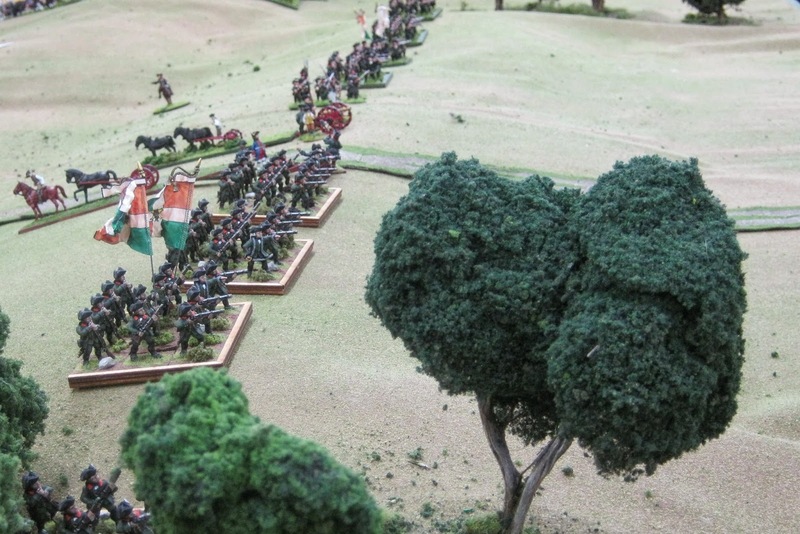 Other French reinforcements arrive but they are too late to hold the ridge. Legion de Fischer infantry has been broken is no more. 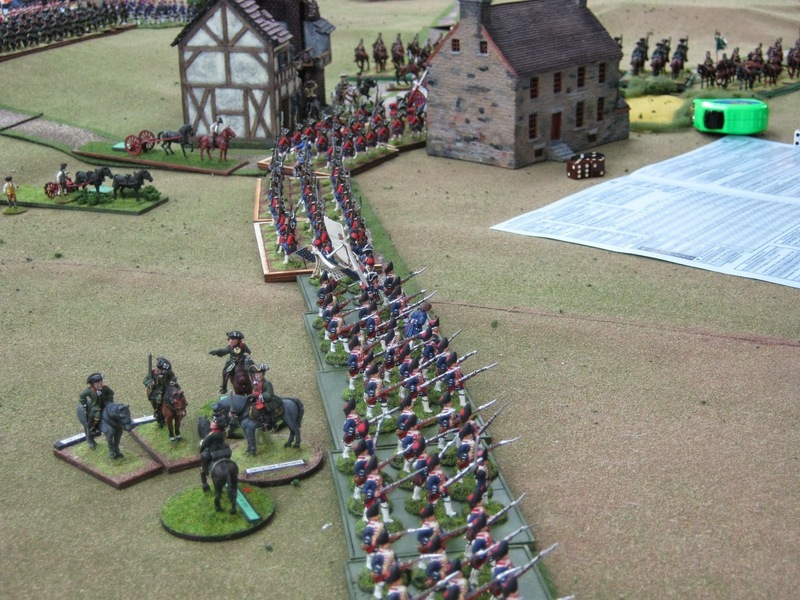 The French line has been bent around Hamelburg.The Gardes Suisse are in the distance at the edge of the village with Grenadiers de France facing red coats atop Hamelburg Ridge. 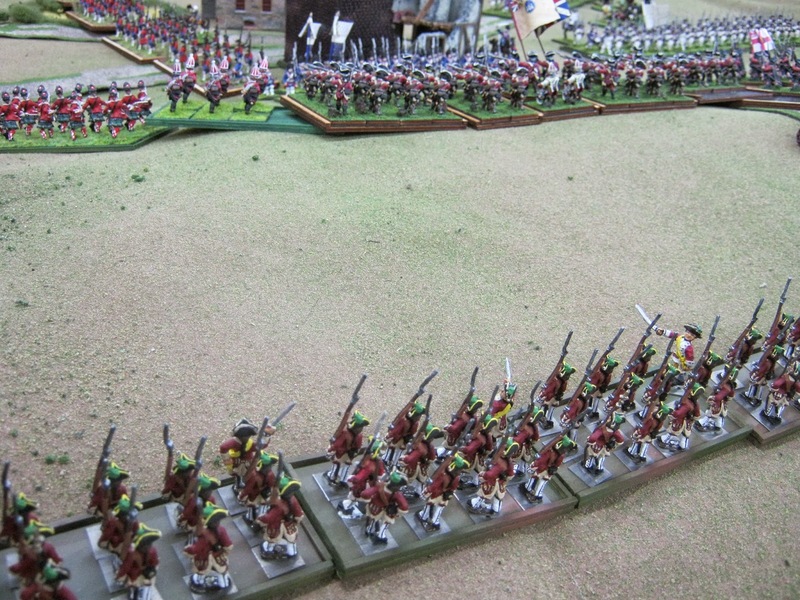 The 27th Foot advance on the Grenadiers de France. 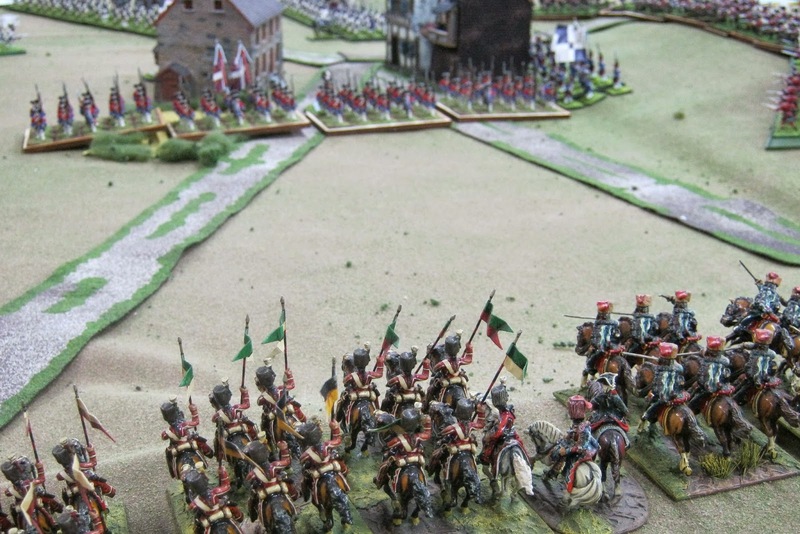 As the Gardes Suisse defend their flank. Unseen by the Prince de Soubise, von Spörcken's Musketeers arrive. They are part of another Allied Brigade arriving to fight at distant Hamelburg. The Prince we may imagine looked over his shoulder hoping for more assistance but it was not forthcoming. He ordered a withdrawal to the south leaving Hamelburg to the Allies. Martha: "My ladies, is this the way? Oh my hat! We've left the road. I don't...."
Lady Diana Pettygree: "No I guess not Martha. We'll turn about...."
Lady Belle Silhouette: "And ride for the Roadhouse Inn on Hamelburg Road. I see it now." Diana: "Mein Herr. Are there French soldiers near - anywhere?" Herr Gottlieb: "Ja. Keep going south. French to be sure." Lieutenant Général l'Duc de FitzJames: "My ladies! What are you about?" Lady Diana Pettygree: "Monsieur l'Général! The battle is lost. We seek safety with you, if you please." Fitzjames: "A dispatch just arrived to that effect. 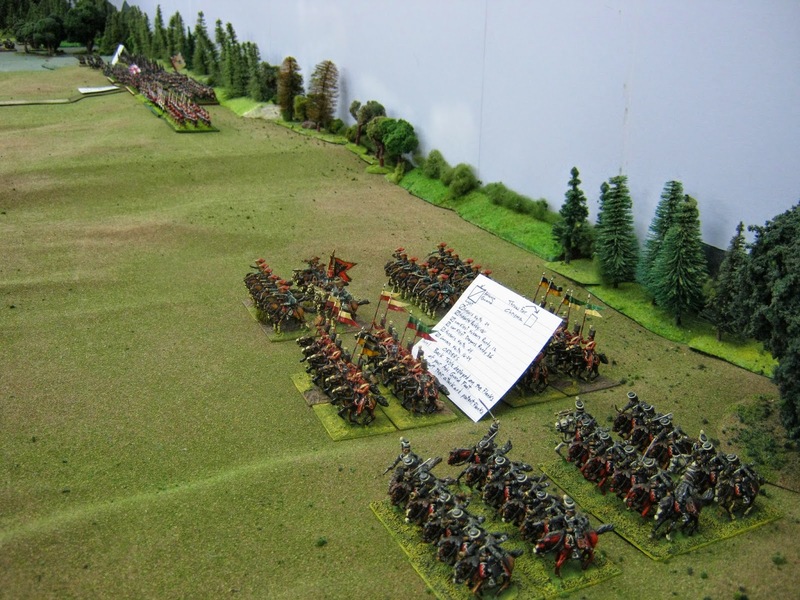 My Brigade of Cavalry as well as the infantry marching with us was too late to intervene. 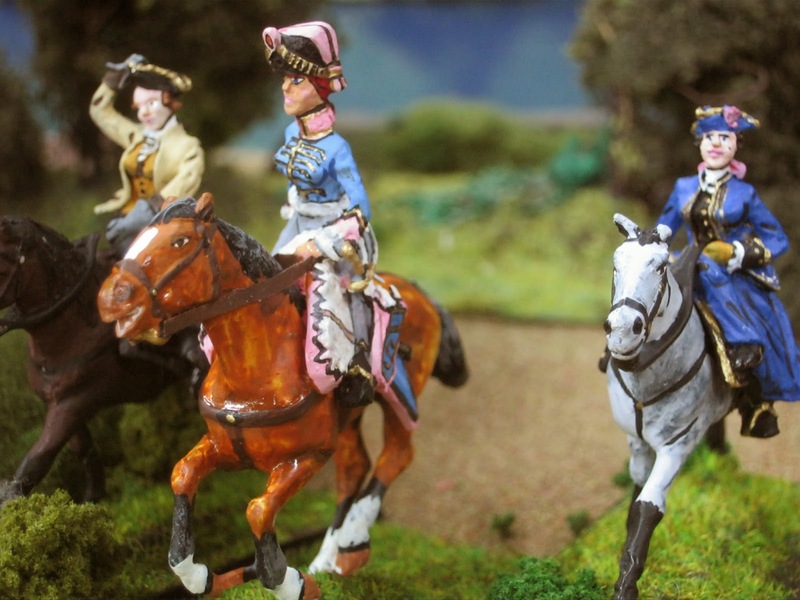 We will need to cover the retreat of l'Prince de Soubise. Still --- this is good ground and we could form a new battle line to fight again tomorrow. --- Excuse me ladies. I have work to do. ORDERLY!" 1) Many thanks to Der Alte Fritz, Jim P., for this entertaining and different scenario. 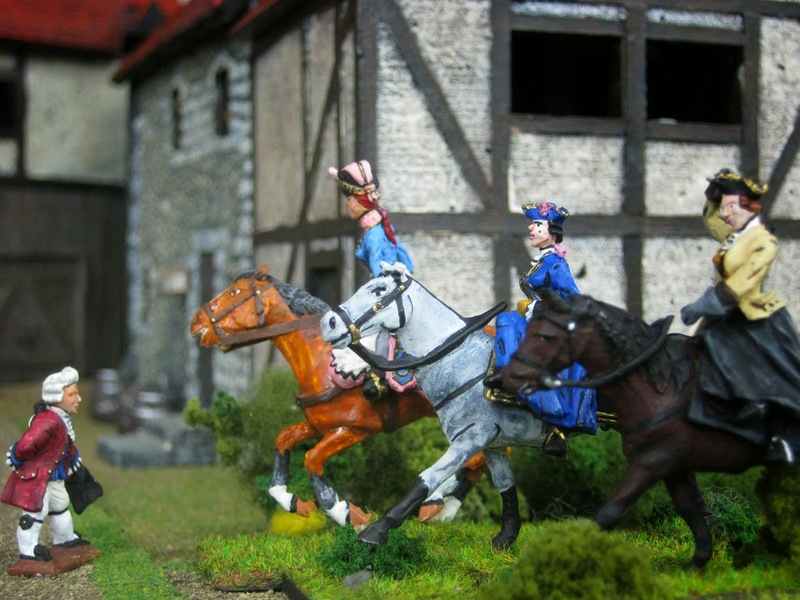 Can you guess what historical battle Hamelburg resembles? 2) Extra thanks to Randy and Keith for bringing extra units when Jim's had to stay home with him. 3) Other Allied Brigades were arriving elsewhere on the battlefield from different directions. Hamelburg is a hub. 5) Your remarks are welcome at Comments below. I beg your forbearance advising there will be a pause before these appear due to a spammer.